Brendan Griffin as “Christian” and Patrick Page as “Cyrano de Bergerac” . Photo by Craig Schwartz. 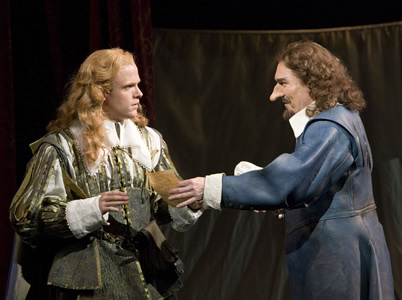 The 2009 Old Globe Shakespeare Festival opens with Cyrano de Bergerac by Edmond Rostand. Rostand, a French dramatist, wrote this masterpiece in 1897. This is the first time in six years that the theatre has scheduled a non-Shakespeare play for its summer program. Needless to say that the stakes are high when selecting a work that could compare to those of the celebrated English poet, but resident Artistic Director Darko Tresnjak succeeded in hand picking Anthony Burgess’ translation of Cyrano. It is magnificent, preserving the dramatic integrity and poetic genius of the original French version. Cyrano de Bergerac, like many of Shakespeare’s plays, tells a story of mistaken identity, where a talented poet, swordsman, and Cadet in the French army, Cyrano, falls in love with the beautiful Roxane, but lacks the confidence to reveal his true feelings due to his abnormally large nose. Resigned to his loss, he offers to help his inarticulate, yet handsome fellow soldier Christian win her affections by writing love letters on his behalf. Roxane soon falls in love with the author of the letters not realizing it is Cyrano. Acclaimed Broadway veteran Patrick Page (A Man for All Season, The Lion King) stars in the title role. Cyrano’s masterful eloquence is served remarkably well by Page’s powerful voice, so much so that the audience quickly forgets the protuberance at the center of his face only to be conquered by Rostand’s words. Page’s performance is outstanding. He is in good company with the beautiful Dana Green as Roxane and Brendan Griffin as Christian. The rest of the talented cast consists of 19 actors in residence at the Old Globe who, as part of the summer company, will perform in repertory in this production as well as in Shakespeare’s Twelfth Night and Coriolanus. It includes, but is not limited to, Celeste Ciulla as Roxane’s fun chaperon, Grant Goodman as Cyrano’s faithful friend Le Bret, Eric Hoffmann as poetic cook Ragueneau and Bruce Turk as the Comte de Guiche. The play is skillfully directed by Darko Tresnjak and the beautiful outdoor Lowell Davies Festival Theatre is the perfect intimate venue to witness the seduction, romance and passion unfold. It is hard to imagine that Rostand meant this drama to be performed anywhere else than under the stars. Tasteful scenic design is by Ralph Funicello, costumes by Anna R. Oliver, lights by York Kennedy and sounds and music by Christopher R. Walker. With all these elements combined, this production of Cyrano de Bergerac offers its audience a first class theatrical experience.